Bill Evans died, at the age of 51, on Sept 15, 1980. In what has been described by friends and family as "slow suicide," he finally succumbed to the effects of the years of substance abuse. Like Charlie Parker before him the world was alternatively too beautiful and too ugly to endure. 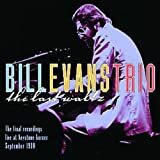 For fans of Bill Evans, like those of Bird, the Grateful Dead and today's Phish, his live performances have been extensively bootlegged, traded and revered. 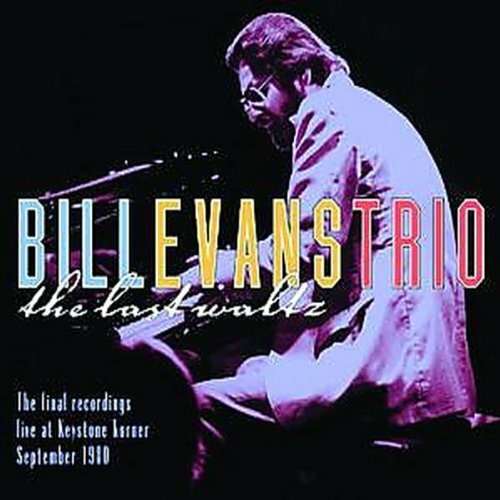 The Last Waltz is the last recording of Evans and his trio made just a week before he passed away. Evans was schooled early in the European classical piano. His studies and eventual college degree in music and music education were not the typical resume for a jazz star in the early 1950s. But then again Evans never fit into a typical jazz scenario. A fan of Nat King Cole, Evans always applied the structure of the European tradition to his music. The criticism that he didn't swing or play the blues always followed him, yet Miles Davis called upon Evans as the foundation for perhaps the most important record of jazz history. Of course I am referring to Kind Of Blue, the 1959 modal jazz masterpiece. Evans, the inspiration and co-author of the recording date, influenced not only Miles' playing, but also the creation of jazz beyond the simple theme, solo, solo, theme. Evans endured in Davis' band despite the racist comments and harassing by audiences that believed Miles should front an all-black band. Notwithstanding Miles' continued defense of the pianist, Evans left the band. But he departed with the confidence to start his own bands. 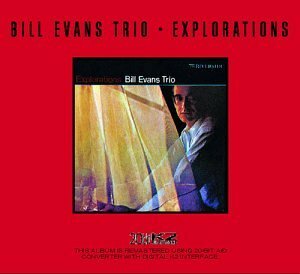 The legend of Bill Evans came in the form of the jazz trio and this format would persist for him over the next 20 year, until his death. His influence can be heard in every pianist recording today from Keith Jarrett, Fred Hersch, to Brad Mehldau. Evans' jazz trios, from the first with bassist Scott LaFaro and drummer Paul Motian, to his final trio of Marc Johnson and Joe LaBarbera, included jazz innovators, not merely sidemen. His bassists have included Eddie Gomez, Gary Peacock, Michael Moore, George Mraz, and Chuck Israels. The list of drummers is long and rich with the likes of Philly Joe Jones, Marty Morell, Eliot Zigmund, Larry Bunker, Marty Morell, and Jack DeJohnette. Each in his own way helped Evans redefine the jazz trio. Beginning with his 1961 live recordings from New York's Village Vanguard, Evans (like Sonny Rollins) almost always sounded better in a live setting. That may be a strange concept because Evans was a shy, withdrawn performer that rarely communicated with the audience to even name the tunes played. I couldn't help but compare this last date with the Vanguard recordings Waltz for Debby and Sunday At The Village Vanguard (Riverside). But it's like comparing apples to oranges. It can be argued that Evans circa. 1961 was at the pinnacle of his career. Every fan cherishes the creativity and unbridled joy of these sessions, what Nat Hentoff called "Urgently Imaginative." But they were recorded just weeks before Scott LaFaro was killed in a car accident, before Evans' brother and longtime girlfriend were to commit suicide, and before Evans began to feel the debilitating effects of his drug abuse. Exulted as some sort of a jazz God, Evans struggled with his burden to communicate for the next twenty-years. These final sessions, like the collected Village Vanguard session of the same year, Turn Out The Stars (Warner) remind me of Art Pepper's Village Vanguard recordings. 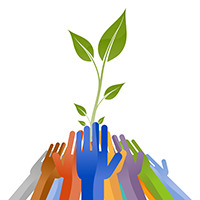 Pepper, like Evans was ravished by drug abuse and knew that his life was coming to an end. Both artists also knew they were no longer in top form on their instruments. But for both, pure expression was their goal. Evans was almost sprinting to heaven, making each gig, each set, and every song count. Sure I prefer the 1961 version of "Waltz For Debby" to this 1980 track, but I treasure his sacrifice more here. These sessions consist of 65 tracks recorded at San Francisco's Keystone Korner over nine days. The then unauthorized taping is of good quality, and for fans of the great one these recordings remind us of the beauty that the tragedy of living is.